Bishop Paul was born in Hastings and is one of five children. He attended primary school at St Joseph’s in Hastings and secondary school at St John’s College. In 1985 he entered formation for the Society of Mary. In 1993 he completed a Baccalaureate in Sacred Theology at the Angelicum University of Rome and studied to become a teacher. Upon returning to New Zealand Bishop Paul was in teaching roles, including St Bede’s College. 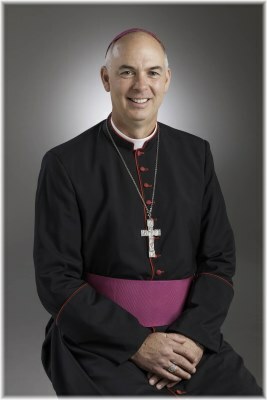 In 2014 Bishop Paul was Assistant Provincial and Provincial Bursar for the Society of Mary, before taking up the position of Bursar General in Rome. All bishops of the Catholic Church have a right to a Coat of Arms (armorial bearings). The primary interest of the Church in the use of heraldry is that each bishop’s distinct personal arms have external ornaments which reflect his rank in the Church. The Coat of Arms, of Most Reverend Paul Martin SM is composed of the shield with its various charges, the external ornaments of a bishop, and his episcopal motto. 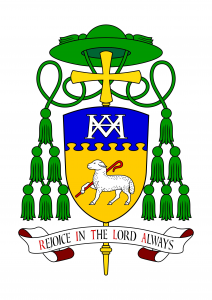 The main charges on the shield (escutcheon) of his personal arms have particular significance for Bishop Martin. The top portion of the shield (the chief) is blue (azure). The Marian symbol (monogram) on the blue sky represents Mary. It reflects the call of Mary to Bishop Martin to be a member of the Society of Mary which uses the Marian monogram in this form. It is a reminder that Mary is the Mother of God and also the perfect disciple of her Son Jesus. Her prayer and example teach us what it is to be faithful disciples. She wants all to know her Son and share in his love as she continues to support the church in these modern times. The gold base depicts the lamb holding the crook and represents the Good Shepherd who is a sign of comfort for us. Jesus the Good Shepherd cares for his sheep and seeks out the lost. It is also a reminder of the call of Christ to shepherd the flock, a responsibility Bishop Martin now accepts as the chief shepherd of the diocese of Christchurch. Sheep are also a reminder of Hawkes Bay, the rich agricultural area where Bishop Martin was raised. This motto invites us to celebrate the love of God for us. It reflects our gratitude for the gift of life that we have received through our sharing in the life of the Trinity, and our gratitude for the wonderful world we have been given to live in. The motto reminds us that in Jesus, we have received the Good News and that rejoicing in the Lord will, by its very nature, compel us to share this experience, encouraging other people to live in relationship with Jesus. The exhortation Rejoice in the Lord always echoes the response of Mary in the Magnificat when she exclaimed, “my spirit rejoices in God my Saviour.” The call of Mary to be the Mother of God was a challenging invitation and one that Mary accepted in faith and hope in the Lord. This too is our call, a call to live our lives with the Lord and within the Christian community. The remainder of the coat of arms distinguishes it as the armorial bearings of a bishop. The shield is ensigned with a green pilgrim’s hat (galero), which is used in ecclesiastical heraldry for clerics – in place of the traditional helmet, mantling and crest. The cords of the galero terminate in six green tassels on each side. It denotes a Catholic bishop. Behind the shield is a single transverse processional cross of a bishop extending both above and below the shield. The following is the textual description of the coat of arms in traditional heraldic terminology called blazon. BLAZON: Or a lamb passant Proper holding in the bend of its front dexter leg a shepherd’s staff Gules: on a chief nebuly Azure the monogram of the Blessed Virgin Mary Argent. Coat of arms designed and emblazoned by Fr Guy Selvester and Richard d’Apice and illustrated by Sandy Turnbull.